The art of Destiny is one of the unique qualities that makes it stand out from many games in recent memory. Many guardians can still remember the first time their boots hit the soil of the Cosmodrome and how breathtaking the environment was. From the four-eyed enemies to the rusting relics of the golden age, the imagery ignited a passion for exploration that shaped our journeys through this universe. Bungie Developer Chris Barrett and Community Manager Deej recently sat down with IGN to discuss how the art influenced game design, as well as share previously unreleased Destiny concept art. As Chris told IGN’s Fireteam Chat, the art department sometimes got an idea perfect after only a few iterations, but others took as many as 100 changes before it came together. This explains why Vanguard comedian-in-chief Cayde-6 appears in the images as human. It was shared that some of the Bungie art team went to classes to learn sculpting and anatomy to build models for some of the set pieces we see in the game. However, Deej said most of the environment goes straight from 2D paintings into programs where developers start 3D modeling. While many of the concept images changed significantly over time, Chris made it clear the team had an early goal of making crests, symbols, banners, flags, and insignias important components of the game. The queen, for instance, is seen in a few different outfits, but her faction symbol is placed on those outfits early. 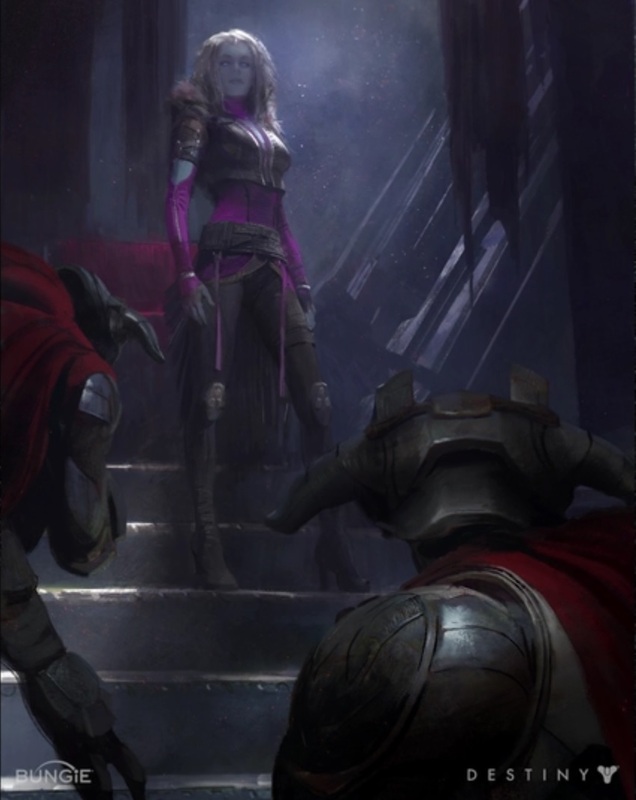 The art team actually went through many iterations of outfits for Queen Mara Sov, going back and forth between ball gown type clothes to warrior armor. The Queen’s Guard came together quickly, but the Awoken took some time to develop and originally were referred to as “Space Elf Vampires”. According to Barrett, the team knew early on they wanted 3 classes of characters. Titans, Mages (Warlocks), and Rogues (Hunters). The armor did change. The Titans were originally designed to look almost like Iron Man, while the Warlocks were originally intended to be the most futuristic. Hunters landed somewhere in the middle and were made to look like they scavenged their clothing from the wasteland. The team also knew they wanted different planets to have certain color palettes. Mars, red. Venus, green. The Moon, blue. The hive ships weren’t meant to have a color palette, but the team wanted the inside of Tomb Ships to look like a sunken ship floating through space. This involved vegetation and flowers growing on the walls. The team made sure to express that the concept images aren’t meant to reveal cut content. Most of the weapons and armor seen in the images was drawn before any game design took place. 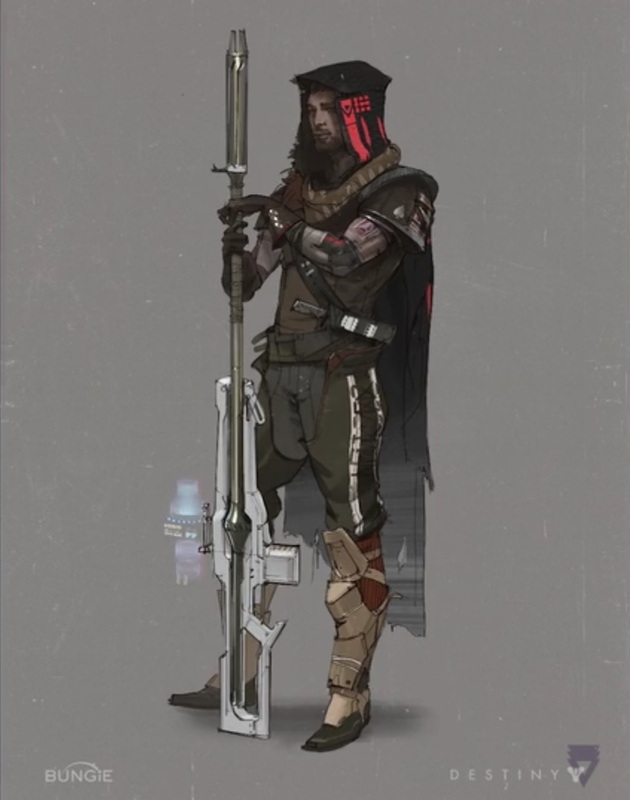 They were never going to make it into the game (Cayde-6 was seen to holding a sniper rifle taller than him. ), but some of the weapons looked awesome.